Easy installation in round duct. 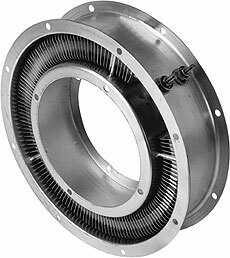 The DAB Series is a coiled finned element complete with sheet metal enclosure. Flange permits easy gauging of units to augment heating capacity. Air is forced over elements only. The center openings of all DAB units may be enclosed with a sheet metal baffle furnished with the unit. When a number of units are interconnected, the center opening of just the first and last heater in the series are closed. Controls. For thermostatic control (AR thermostat) and overheat protection (Type ARC), see Controls Section P.
Alloy wire or bus bar should be used for power connections. (See Section Q) Mounting gaskets are supplied with each heater to minimize air leakage between the heater and mounting surface or between heaters. Gasket material is non-asbestos. Watts W/In2 Volts Dimensions cm (in) Model No. Wt.